In this blog post I want to share some of my favorite food blogging tips with you! I brought a very specific example with me today. 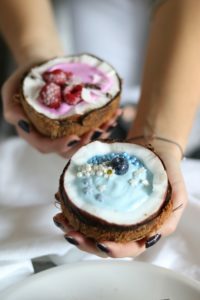 I will show you my food blogging tips while preparing coconut bowls with you! Food blogging is an art for itself. Don’t you think that most dishes look extremely hard to make? Looks like we spent hours doing it? 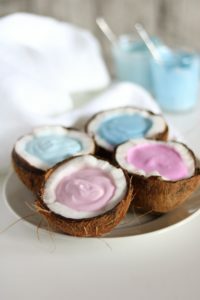 I will explain some simple steps by showing you how to make pastel coconuts. Anything with yoghurt is usually a good choice for a great foodpic. It stays in place and doesn’t start melting like if you were for example taking pictures of nice cream. 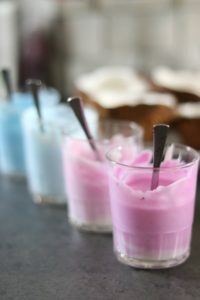 The simplest thing is to give the white yoghurt some color. 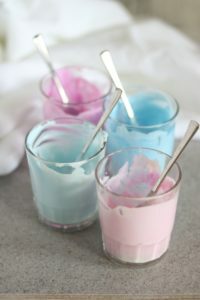 You can do different shades of one color or in our case have an array of pastel colors. If you look at the picture on your left even the simple colored yoghurts already look like art for themselves. Don’t they? 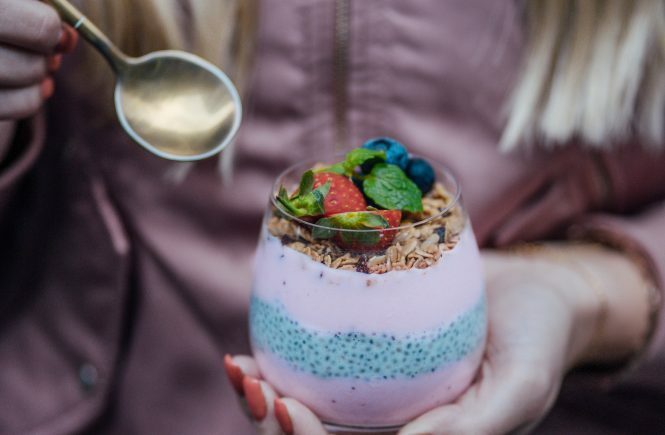 Another simple trick that I love to use is pouring the yoghurt, chia seed pudding or nice cream into tropical fruits. Coconuts work extremely well, as they usually give great contrasts to your pictures. But you can also use pitayas, pineapples or melons. All of these will be a true eye-catcher. If you work with nice cream, make sure to freeze the coconuts or any other fruit you will use as your bowl before so your ice cream won’t melt that quickly when you are trying to take the perfect picture. Now we come to the most important part: the decoration. What always works wonderfully is to freeze berries. Once the thaw a bit they will have a beautiful silver shimmer. Make sure to spend a lt of time on the decoration. This can make or break your dish. This can turn your plain boring yoghurt into a piece of art. So get creative and have an eye for details. Tip #8: get creative and have an eye for detail – personally I think a great decoration is the most important thing! So now you know some of the basic super important food blogging tips and tricks. Please let me know if you want me to write more blogposts on this topic. Is there anything you would like to know in specific? Let me know in the comments! 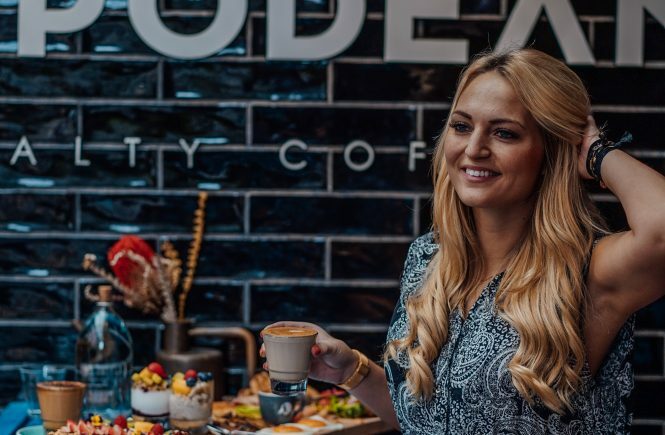 Also if you are looking for more helpful food blogging content, I recommend you check out my Instagram Growth tips and tips on how to food blog and travel! I also have a wonderful YouTube video on my best food decoration tips. Food Blogging Online Course – grow your food blog!